The Best Strength Training Exercise for Whole Body Power? Looking for the best strength training exercise to develop whole body explosive power then you needn’t look any further than the power clean? The power clean is the king of all whole power exercises. What makes it the go to exercise for the development of power is that it has the additional benefit that when the movements are performed correctly, you will also see an improvement in neuromuscular co-ordination, the later point being a critical factor in the production of power. However, with the exception of Olympic lifters the power clean is often executed so poorly by the general sports community, that they do not get the full benefits of its execution. You will often see athletes executing this strength training exercise with poor posture and bad sequencing, which at best, is an accident waiting to happen, or just simply a waste of the athlete time and energy. The power clean is typically performed with an Olympic bar and full size weights discs. 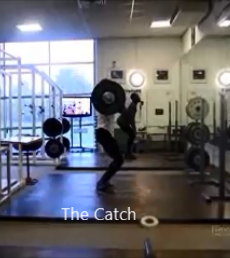 The lifter addresses the bar with shins about 5-10cm away from the bar and feet shoulder width apart. The bar is held with a hook grip (that’s a grip where you place your thumb around the bar and then wrap the remaining four fingers around your thumb and bar simultaneously) approximately shoulder width apart. The lifter begins the lift by first flattening their back and then extending their knees. 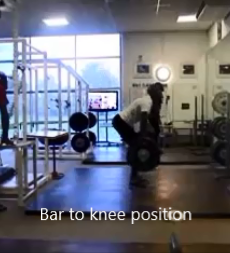 The extension of the knee is the first movement of the lift and it is responsible for the bar rising to a level just above the knee. 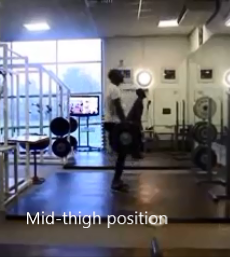 Through this initial movement the hip remains flexed and helps to keep the bar close to the shin. As the hip extend, the knee rapidly re-bends slightly. In Olympic lifting circles this is called a double knee bend. It is quite a complex action but it does put the lifter in very favourable body position to apply force. This variable can be difficult to teach and learn, but if you have the patience it is well worth your time. This variable is very simple. Simply begin the extension of the hip just before the bar crosses the knee. 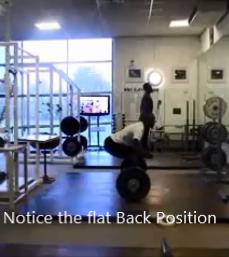 This ensures you get into that strong body position we talked about earlier and although the bar may move a little away from the shin, this should not constitute a danger to you. Most none Olympic lifting sport will utilize this variable. At this point the bar should be at mid-thigh, the hips and knees are still flexed.The next stage of the lift is to rapidly extend the hip, knee and ankles commonly referred to as the triple extension, this together with a shrug of the shoulders complete the pulling part of the lift. 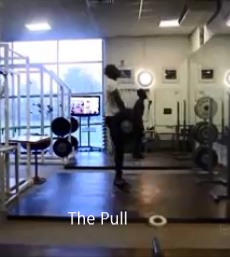 As soon as the pull is completed, the lifter flexes the knee while pushing the elbows under, forwards and upwards as a way of offering the shoulders as a platform to catch the bar. This makes it easier for the bar to be caught on the shoulders. When the bar is caught, the lifter stands erect to complete the lift. Finally, clean from the floor – putting it all together. In Olympic lifting the “pull” phase of the clean and jerk is proven to be one of the most powerful movements in all sports. As a strength training exercise or to more specific “power exercise” with the ability to teach you how to be more powerful, it is second to none. Try it! From "Strength Training Exercise" Back To "Faster, Stronger, Better – Your Shortcut To Improved Athletic Performance"
Learn more about strength training exercises.